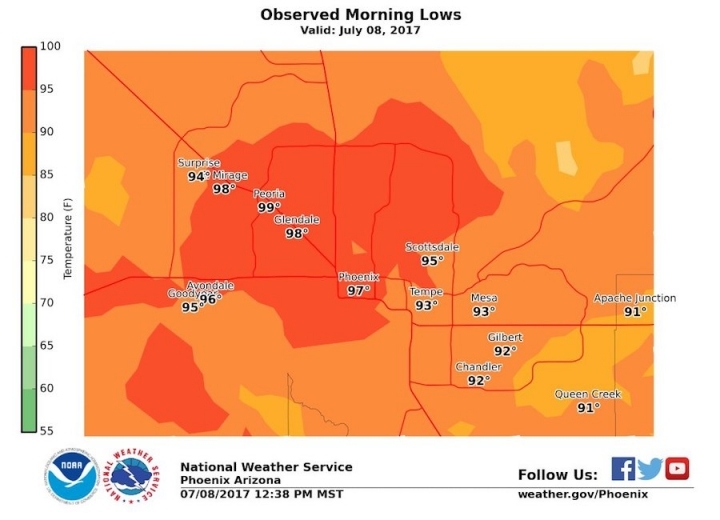 Temperatures in Phoenix soared to 118°F on Friday, besting the old record of 115°F set in 1905, and marking the third day of 2017 where temperatures were at or above that level, the second most on record. In Salt Lake City, the temperature reached a record 104°F on Saturday. The city had three record highs in just four days last week. The Boise airport also saw 104°F on Saturday, besting the record of 103°F set in 1968. The heat and accompanying dry conditions can also set the stage for wildfires, as was the case during this heat wave, which saw several wildfires ignited and grow across the region. The Whittier fire, which started on Saturday in the Santa Ynez Mountains in Southern California, has burned more than 10,000 acres, while the nearby Alamo fire has burned nearly 29,000 acres and forced several thousand people to evacuate. The ridge of high pressure is moving eastward this week, bringing sweltering temperatures—and the threat of wildfires—to the northern and central Plains before shifting back to bake the West again at the end of the week. At that point it could strengthen, meteorologist Guy Walton wrote on his blog, keeping the West good and toasty for the next week or two. With temperatures continuing to rise—and no substantial effort yet to curtail the greenhouse gas emissions driving that rise—the world at large stands to see more such extreme heat in the future. Another recent study found that half of the world’s population could be exposed to heat that reaches deadly levels by the end of the century even with the most stringent reductions in greenhouse gases. These kind of heat waves pose threats to public health, local economies and infrastructure. The increased use of air conditioning can tax the electric grid, while the heat can damage crops and curtail outdoor activities, such as construction. During a June heat wave, planes in Phoenix couldn’t take off because higher temperatures lead to thinner air, making it more difficult for planes to get off the ground. And searing heat can be deadly to already vulnerable populations, such as the elderly, small children and those suffering from illnesses. High overnight temperatures are a particular concern when it comes to the health effects of heat waves, because they prevent the body from cooling down and recovering from the heat of the day. Nighttime lows have risen across the Southwest since 1970, ranging from an increase of 1.7°F on average in California to 3°F in New Mexico.